I retired from Jelitto Perennial Seeds last month, and it’s been cold and gray in Kentucky ever since. I have to be picky about my newfound spare time. I’m poring over seed and plant catalogs—a fun winter ritual—and I don’t want to be tangled up in politics when the redbuds bloom. I need to be ready to plant penstemons and phloxes in Salvisa. But look what I’ve gotten myself into. Politics make my blood boil. Mayfield, KY. Solar Energy Solutions photo. 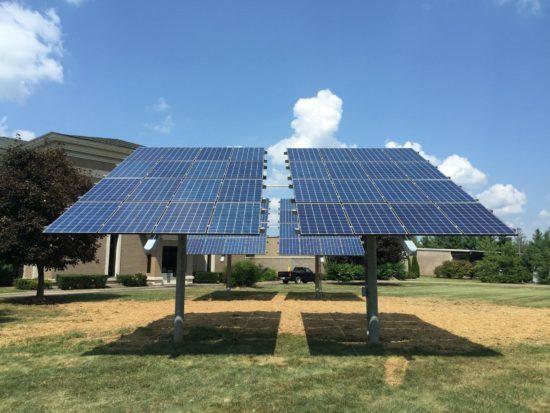 Here, at home, the Kentucky House Natural Resources and Energy Committee passed legislation last week that could cripple Kentucky’s solar energy growth. 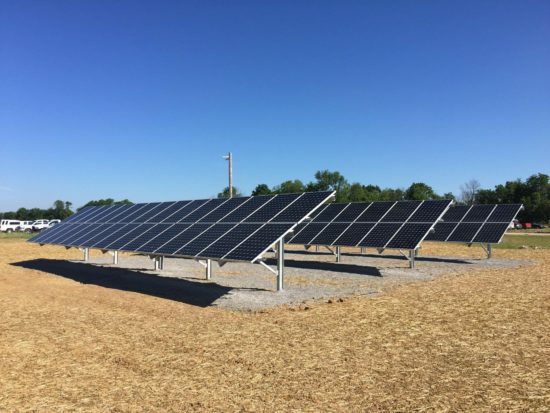 Business groups such as Greater Louisville, Inc. (GLI) and the Kentucky Chamber of Commerce have advocated strongly in support of HB 227— a bill that may jeopardize many of the estimated 1,200 solar jobs in Kentucky. GLI and the Kentucky Chamber reside within a closed loop. You scratch my back; I’ll scratch yours. They are forsaking potential job loss with their support of HB 227. In this case, it’s downright peculiar that they don’t care about job loss. 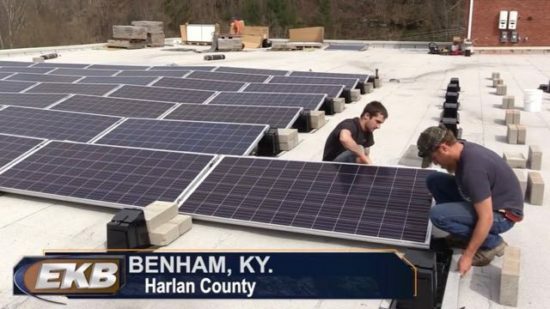 Kentucky needs a secure energy infrastructure, but there’s no need to throw solar power under the bus. Solar should be a partner in job growth, providing decentralized, and secure, energy production. House members attempted to stir up a rural-urban divide. Some contended that most of the solar installations are in larger cities. That’s not true, according to Steve Ricketts, partner with Solar Energy Solutions, the state’s largest solar installer. Seventy percent of their jobs have been outside Bowling Green, Lexington and Louisville. How can anyone—or any group—be so afraid of science, truth and the power of the sun? Simpsonville, KY. Solar Energy Solutions photo. The sun makes so much sense. The planet is 93 million miles away and wirelessly delivers energy to Kentucky in nine seconds—free of charge! Kentucky Coal Mining Museum. Benham, KY. EKB photo. Free and naughty, according to some warped sensibilities. The utilities stress that owners of solar power are getting a free ride and are being unfairly subsidized for the excess power they produce. All other utility customers are covering the costs of the solar elite, they argue. Meanwhile, every Kentucky utility customer is footing the bill for the dark suits that roam the floors in the Capitol Annex, lobbying for the utility companies. Hopkinsville, KY. Solar Energy Solutions photo. HB 227 will be up for a full house vote soon. 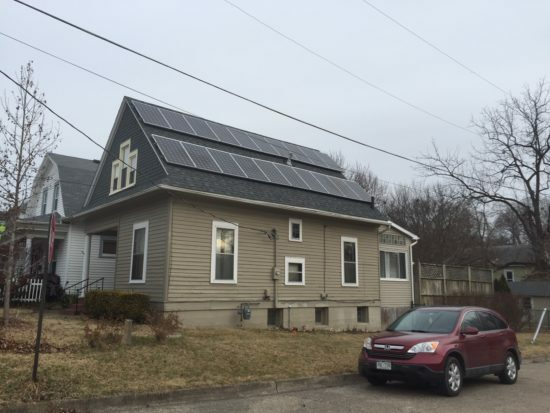 A number of the 16 proposed amendments seek a reasonable compromise that would provide fair compensation for the value of the homeowner’s solar energy as well as fair coverage (operating and capital expenses) for the utility companies. 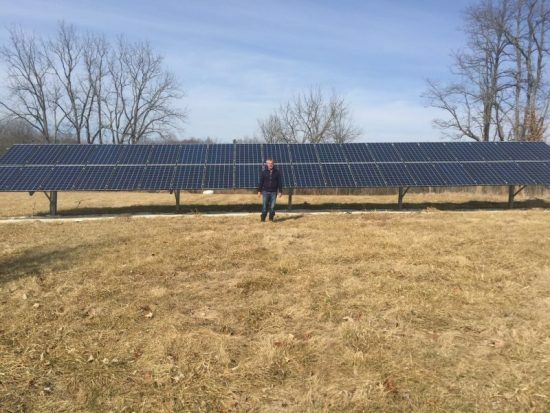 Why cripple Kentucky’ solar energy future? If you are a Kentuckian, please call the Kentucky State Capitol at 800-372-7181. Tell the friendly operator you are opposed to HB 227. It will take only 2 minutes. Solar, wind, anything that could cut into the profits of the fossil fuel industry are under assault these days. And certain politicians are happy to do that industries bidding. Some might argue this isn’t a gardening issue but it certainly is. Burning fossil fuels is the leading cause of climate change. This is not just leading to global warming in general but more intense weather events. 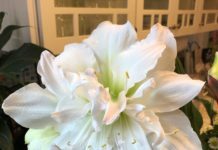 Here in Wisconsin, insect pests and diseases are appearing that used to be found only in areas far to the south. 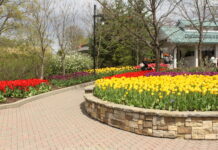 The more frequent and intense hurricanes, tornadoes, ice storms, hail, you name it, really make gardening a challenge. Every little bit that slows the burning of fossil fuels helps. Thanks, Allen, for fighting for a little more sanity. We all need to fight this BS. There are two reasons that stick in the Koch brothers’ (and others) craw – as Chris said above, alternative energy cuts into their profits. But secondly, no one can own the sun or the wind, so consequently no one can charge us through the nose for that energy. That drives the conventional energy companies crazy. It’s the same up here in western NY. We are overblessed with wind up here, and it makes me crazy every time I hear that people are opposing wind farms. We have it, it’s renewable, let’s use it so that eveyone benefits! I am so tired of the Republican party, the Kochs, the insatiable greed, the allergy to science and facts. I don’t want to live in a country where the only jobs are dangerous jobs where men and children labor in the bowels of the earth the way they did a hundred years ago. Women, of course, have to accept that they’ll starve. Keep fighting the good fight! I would love to do solar power but everyone always tells me it would take 20 years to pay for it. Is this true? How do I go about trying it out? Do you know someone close to Cincinnati who does this? Breakeven is 10-12 years at most in the majority of KY for panels which last 30 – 40 years. There is still a 30% Federal tax credit. Thanks, Joan. such. It was started by their leading power /utility company and **everyone** is a partner. Urban/rural “issue” is baloney! 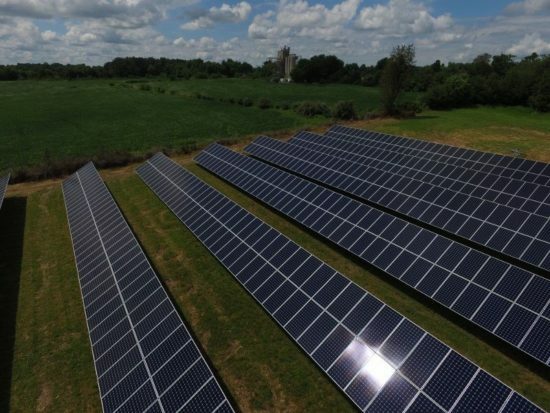 We were in Vermont last Summer and almost every farm we saw there has solar – on the houses, in the fields, on the roofs of the barns! Ditto their many artisanal small growers and craft businesses. The Koch Brithets, Massey Energy et al simply hate what they cannot control. They must be stopped. This is — still — a democracy! Koch “Brothers,” sorry for the typo. As for wind, if Texas of all the Gawd-forsaken right wing states, can embrace wind power, so can KY or any state with high winds. Here in Colorado, our largest utility offers us the ability to have wind power as a part of our energy mix, at an affordable rate. It doesn’t have to be a zero-sum game; there’s plenty of room & money for ALL. As for the dreaded, obscenely-wealthy Koch Brothers, please join the boycott of their products made for households. Starting with AngelSoft bathroom tissue & Bounty paper towels. Koch Industries owns Georgia Pacific Co which makes those products. Last, this most definitely IS a gardening issue. Keep on ranting, Allan! Love your articles & your passion!